Lot 362. Elymaian Kingdom. Kamnaskires III, with Anzaze. Ca. 82/1-73/2 B.C. 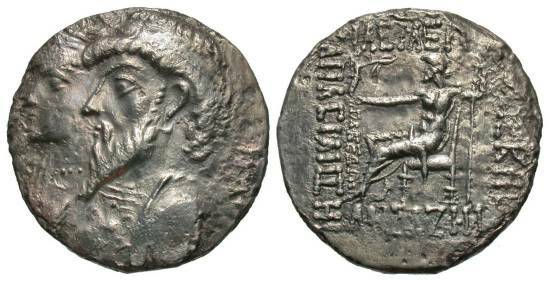 AR tetradrachm (27 mm, 15.43 g, 1 h). Seleukeia on the Hedyphon. Conjoined busts left of Kamnaskires and Queen Anzaze; behind, anchor / Zeus seated left, holding Nike and scepter. Van's Haaff 7.1. Edges a little rough. Very fine.